Welcome friends! 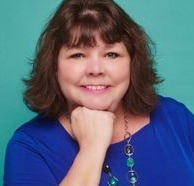 Today marks week two of a fun new home tour series I am participating in called the Room By Room Summer Showcase. It is hosted by Amy at My Life From Home. The Summer Showcase will include a link up of bloggers’ home tours, featuring rooms as they are now and including plans for future decor and renovations. It actually started last week with Entryway Ideas, but as I was on vacation I was unable to participate. But you will definitely want to check out last week’s projects as there are so many great ideas! When my youngest daughter left for College three years ago I decided to downsize from a 3 bedroom Colonial to a 2 bedroom Townhouse. It was not an easy transition as you definitely accumulate a lot of stuff over the years. But, it was too much to keep up with on my own. The Townhouse is perfect because I don’t have to worry about snow removal-living in New England we get a lot of snow! The Association does a great job with landscaping and I have a full finished basement for my Son to live in. The one negative is it has a tiny galley kitchen. 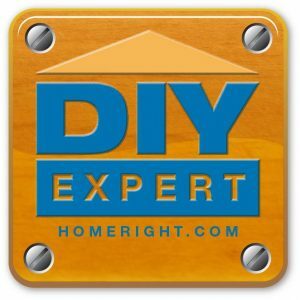 I will show you some of the small DIY projects I have done since I moved here and then tell you what my plans are. I have big plans for this small space!! The kitchen has a blue and white color scheme that I really like. I love the porcelain sink and the large window that showcases the beautiful view. 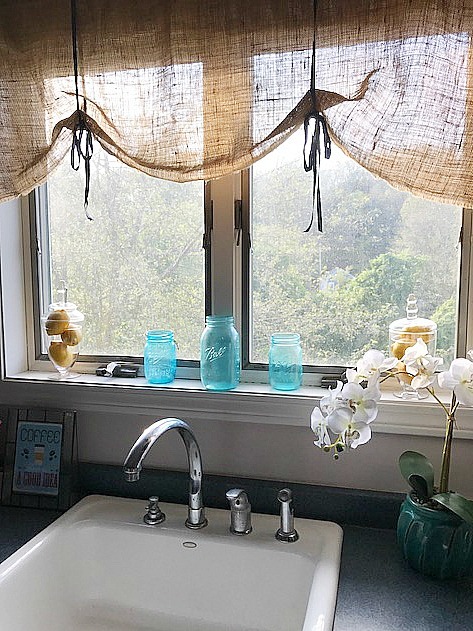 I didn’t want to hide that view so I made a quick and easy no sew burlap curtain that you can see here. The HOME tin letters add a farmhouse touch that I really love! 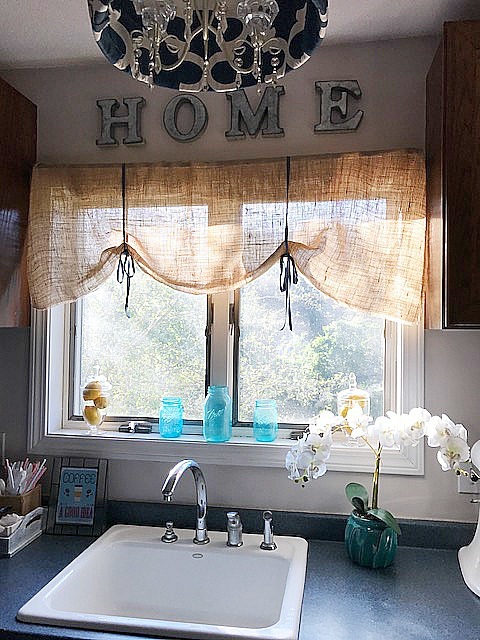 The orchid is not real but fills in the space by the sink perfectly and is nice to look at while doing dishes! The kitchen has beautiful dark hardwood floors, but I really think they would pop if the cabinets were painted white. That is another project on my to do list. Of course I will have to add new hardware as well. I am trying to decide if I should go with a classic white or a white with antiquing around the edges. What do you think? Once I decide on the cabinet color, I will also freshen the kitchen walls up with a fresh coat of paint. Finally, I would love to add this gorgeous travertine tile. Isn’t it stunning? 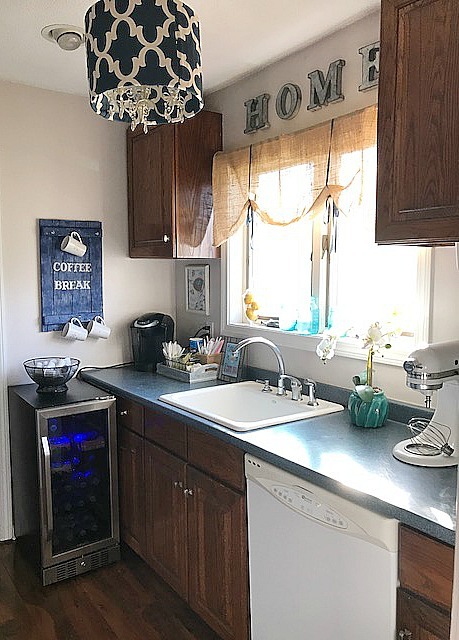 I really like the different shades of blue and think it would look pretty with white cabinets. Well I hope you enjoyed my small kitchen tour and hope you will come back to see my progress with this space. Be sure to visit the bloggers below to see their beautiful kitchens! Thank you so much for visiting! I would love it if you would subscribe to my email so you never miss a post. Have a great day! 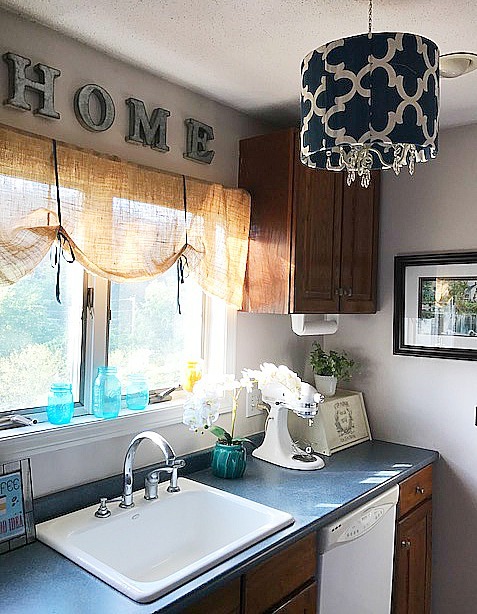 I love your coffee station & your stylish DIY light fixture! 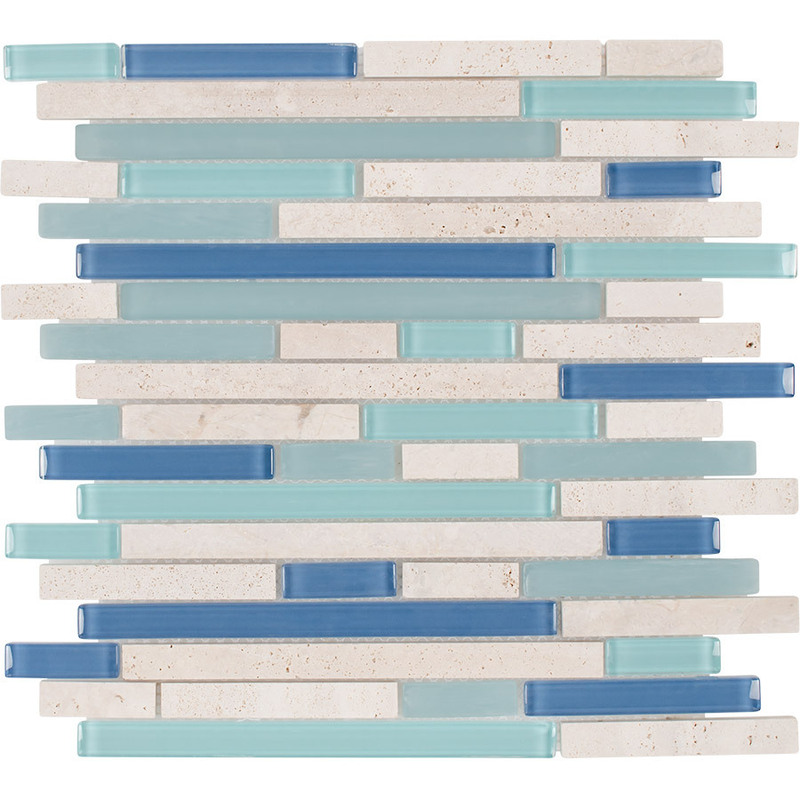 The accent backsplash you’ve picked out is so beautiful – can’t wait to see how you transform this space! You did a great job with the kitchen. I love the coffee station. I feel your pain because my kitchen is too small too! It’s the only part of our house I can’t stand and yet it’s where I spend 85% of my time! Lot’s of goodies to take a peek at here! 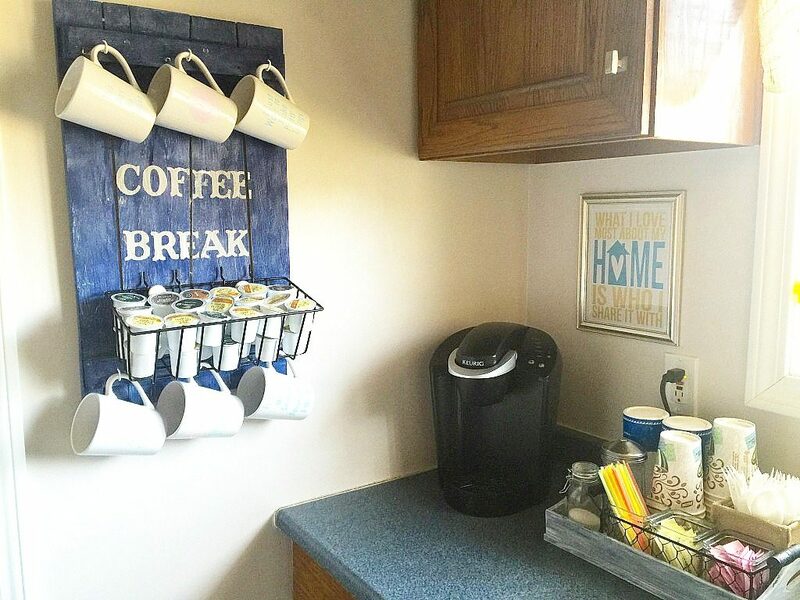 Great ideas and I LOVE your coffee station. 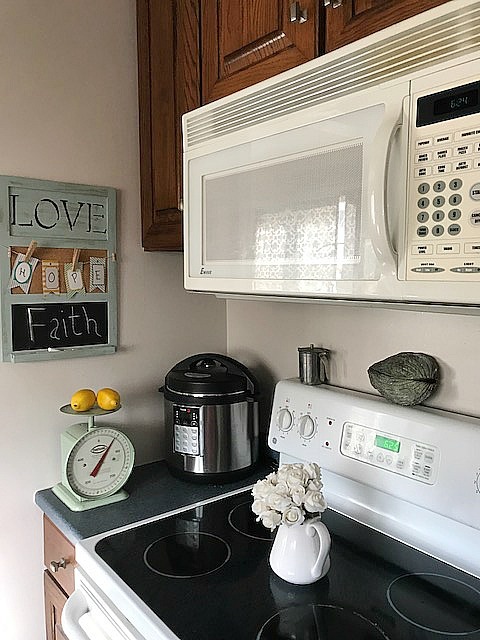 Your kitchen is so cute! Love your lighting fixture and coffee station! And, of course, I love your blue mason jars in the window. Between the two of us, we should start a blue glass jar lovers club. Haha! I love that you added that chandelier! What a great use of a small space. It’s very warm and inviting! Thanks Amy. I would love to knock a wall down and create a built in-baby steps right? 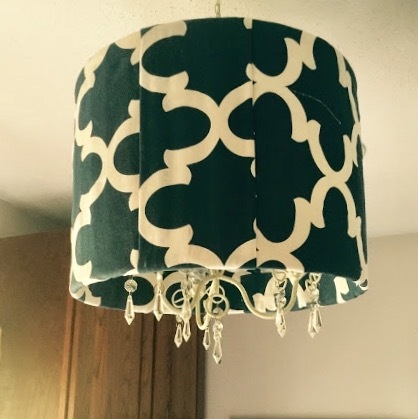 That DIY light fixture is such a great idea! And what a cute coffee station! Thanks Meg! Have a great day! Your kitchen is great! I love the coffee station and the hanging light! Thanks so much Erin! Trying to make the most of a small space 🙂 Have a great weekend!